This giant snow globe photo booth can be put indoor or outdoor, like shopping mall or family back yard. 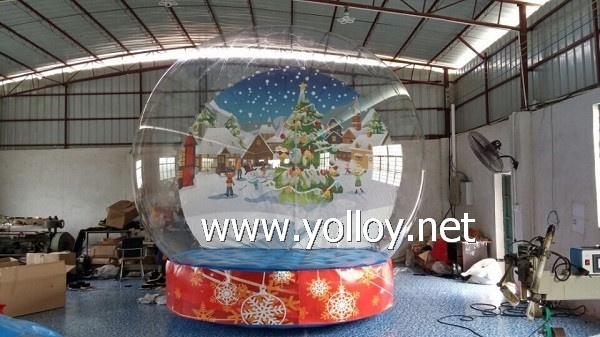 it's not only a Christmas decoration inflatable snow globe, it's also an human sized inflatable snow globe photo booth, and also can put some promotion item inside as snow globe show dome, Off course, this is also a very good idea to use it as inflatable snow globe bouncy house for kids. It can be accept 2-4 adults or 2-8 kids.The printing backdrop can be remove or change in difference theme. how to make an inflatable snow globe photo booth ? Customized can be acceptable.If any special requirement about backdrop,globe size or base color,pls feel free to let me know. We would like to work with your for a perfect snow globe.